Frank Brown, holding ball, back row, 3rd from right. 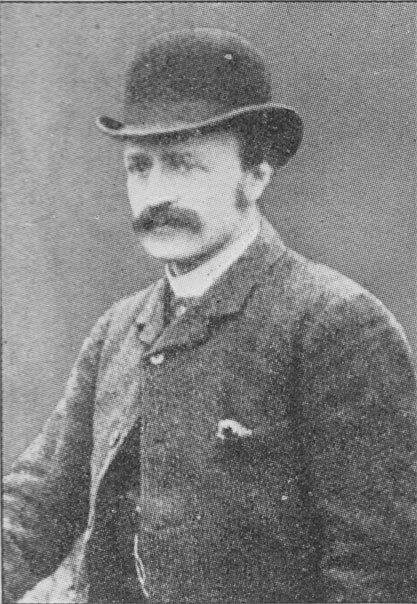 Frank Brown played for Gloucester from 1875 to 1885, and was captain from 1876 to 1883. He was an inspirational leader, who built the Gloucester side into a formidable team. In his final year as captain, 1882-3, he led the “Invincibles” to the club’s one and only unbeaten season in their entire history. He is given credit for developing the “short passing game”, for which Gloucester became famous, and which contributed to a lengthy period of success for the Club. John Frank Brown was born in Bristol in 1856/7, where his father was a gardener, but he moved the family to Gloucester, where he obtained employment as a railway foreman. They lived at 41, Upper Falkner Street, Gloucester, and Frank went to the Crypt School. By the time he started as a Gloucester player he was employed as a post office clerk. Frank Brown is first recorded as playing rugby for Gloucester in 1874-75, the Club’s second season. There are no records of scorers for any game that season, and team lists exist only for the last three games of the season, but Frank played in all of those. So, although he probably played earlier, the first match that we can be sure he played in was at the Spa on 2nd February 1875, when a 0-0 draw was played against the Western Counties. This match was played as a trial for the Western Counties team, and the Western Counties scored 4 tries against one by Gloucester, but in those days, only a goal counted as a score, and none of the conversion kicks were successful. Frank played in at least 6 games in 1875-76. On 12th February 1876, the Flamingoes visited the Spa – they were the London team for which the Gloucester captain and founder, Frank Hartley, had played previously. This was the first Gloucester match for which admission was charged, probably to cover the travelling expenses of the Flamingoes. Gloucester won the game by one goal to nil – F O Stephens scored the try, and Frank Brown kicked the conversion. Even in those early days, the social side of rugby was regarded as important, and in this particular case, Frank Hartley would have wanted to make his old friends welcome. The match was played on a Saturday, and the post-match socialising was held at the Ram Inn. It seems to have gone well, if judged by the fact that although one of the Flamingoes players made it back to London on the Saturday night – the rest of the team didn’t make it home until the following Tuesday. Frank took over the captaincy of the Club in 1876. Over the next seven seasons, under his captaincy, the game grew greatly in popularity in Gloucester, and it was mainly through his efforts that the club rose to high national status. This all happened before the formation of Gloucester Association Football Club in 1889, and was therefore instrumental in establishing Gloucester as principally a rugby city, a legacy which persists to this day. Part of his leadership contribution was to expand rugby into the local community – in addition to the premier Gloucester side, he also organised the Gloucester Post Office and Gloucester Thursday teams, and also encouraged the establishment of parish teams, which were later to prove such an asset in the development of players who would go on to play for Gloucester. Indeed the first 2 working class players, George Coates and Tommy Bagwell, were recruited into the Gloucester team under Frank’s captaincy. During the 1876-77 season, Frank led the team to 6 wins, 3 losses and 2 draws. Frank played in all 9 games for which team lists are known, and scored 2 tries and 4 conversions; this included a try and conversion in each of the wins over the Druids (Bristol) and Ross-on-Wye. In 1877-78, Frank played in all of the 14 games for which team lists are available, and led the team to an outstanding season record of 10 wins, 3 losses and 2 draws, with 31 goals and 21 tries scored, and only 2 goals and 7 tries conceded. With 7 tries, Frank was the second highest try scorer behind Jimmy Boughton with 8; he also handed over the goal kicking duties to Jimmy. Frank scored 4 tries in the win at Worcester by 8 goals and 4 tries to nil; Gloucester enjoyed another huge win by 7 goals and 9 tries against Painswick Institute, but the scorers are not known. 1878-79 saw Frank have his most prolific season as a try scorer with 10 in 14 games, although he was again pipped as the leading try scorer, this time by J F Bennett who scored 11. Frank led the team to an outstandingly successful season, recording 11 wins, only one loss, and 3 draws, and scoring 28 goals and 30 tries whilst conceding only 2 tries all season. There were two big wins over Rockleaze (Bristol) by 2 goals, 5 tries and a dropped goal to nil (one try and the dropped goal scored by Frank), and by 4 goals and 4 tries (3 tries for Frank).The second of these matches was played on 30th January 1879 under floodlights at the Spa – four electric floodlights were erected, but one failed and another flickered on and off. In the prevailing gloom, over two thousand spectators trampled down the shrubs in the park, much to the disgust of the council parks committee, who eventually decided in April to punish the rugby club by suspending them from use of the Spa (by which time only one home match remained in the season). However, they reinstated the Club in September (just in time for the new season). 88 years were to pass before the next floodlit rugby match in Gloucester. This season was also notable for the 0-0 draw at Newport on 7th December 1878, the first match the Club had played against a Welsh club. During the 1879-80 season, he played in 13 of the Club’s 16 fixtures. He led the team to a very successful season with 14 matches won and 2 lost, whilst 28 goals and 27 tries were scored by Gloucester and only 1 goal and 9 tries against. Frank himself contributed 3 tries and 2 dropped goals. When Gloucester beat Cheltenham Training College by 3 goals and 3 tries to nil, Frank scored a try and kicked 2 dropped goals, and it was reported that “the feature of the match was the fine play throughout of Capt. Brown”. The season ended on a controversial note, when Gloucester beat Moseley by a goal and a try to a disputed try – there were 2 umpires, one appointed by each of the teams, but their decision was not final, and the two captains had to agree on any score, which in this case they couldn’t. Frank, still captain in 1880-81, played in 12 of the Club’s 13 fixtures. The results fell off a bit with 6 wins, 4 losses and 3 draws. Frank himself scored 5 tries, two each against Rockleaze and Newent in the space of 5 days, and the other against the Royal Agricultural College, Cirencester. The 1881 census records that he was living with his parents at 41, Ryecroft Street, Gloucester, and working as a postal clerk – his career in Post Offices still had a long way to go. In 1881-82, Frank played in 15 out of 18 fixtures, of which 13 were won. Frank led by example, scoring a try in each of the first 3 matches. Frank’s diplomatic skills as captain were no doubt tested at Worcester where Gloucester won by a goal and 2 tries to nil, because the home crowd invaded the pitch on several occasions and prevented the second conversion being attempted. Worcester said that they could not raise a side for the return match. The greatest victories of the season were over Cardiff at the Spa by 1 goal and 7 tries to nil (the first occasion that the clubs had met), and over Newport at Newport by 1 goal and 1 try to nil (both the return games were drawn). In this era, the captain was responsible for all the training and tactics of the team, and at the start of the 1882-83 season, Frank organised the team into a new formation which became known as “the seven backs formation”. This formation consisted of a full-back (just known as the “back” at the time), 3 three-quarters, 3 half-backs and eight forwards. They also employed what was dubbed “the short passing game”. These innovations were remarkably successful – Gloucester won 11 of their 14 fixtures and drew the other 3, and were dubbed “The Invincibles”. This remains the only season in the Club’s history without a single defeat. Gloucester scored 16 Goals and 35 tries whilst conceding only 1 goal and 6 tries. The greatest victories of the season were over Cardiff at the Spa by 1 goal and 7 tries to nil (the first occasion that the clubs had met), and over Newport at Newport by 1 goal and 1 try to nil. It was reported that Cardiff were so chastened by their experience at Gloucester that they went home and started to develop similar tactics to those introduced by Frank. They certainly recovered sufficiently to draw the return game in Cardiff. 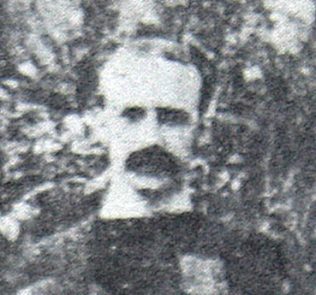 The 16 players used regularly in 1882-83 were H J Berry; H E Taylor, H J Boughton and G Coates; W A Boughton, J F Brown (capt) and H Vincent Jones; T G Smith, P Barrett, P B Cooke, J W Bayley, Ben Sloman, H T Birks, W Brimmell, W Brown, H Fream and G J Dewey (selected from). Frank played in 8 games, and scored 2 tries, including one in that famous victory over Cardiff. At the end of the season he decided that the time had come to give up the captaincy. During the 7 years that he had been leading the team, Gloucester had played 103 matches, won 72, lost 18 and drew 13; they had scored 155 goals and 144 tries, whilst conceding 22 goals and 48 tries. Having handed over the captaincy to Jimmy Boughton, Frank still turned out for 6 games the following season, 1883-84, during which he scored his final try for the Club at Bath on 13th October 1883, when Gloucester won by a massive 5 goals and 12 tries to nil (95-0 in today’s currency). An interesting presentation took place on Boxing-day in connection with the Gloucester Football Club. The club was formed some ten years ago, and though in its earlier days it was perhaps less renowned for its victories than its defeats, yet year by year the style of play on the part of its old members was improved, new blood was freely introduced, and now the enviable position of leading club in the West of England has been attained. From its commencement Mr J F Brown was one of its principal supporters – indeed, he took a prominent part in its formation; and when three years later he was elected captain of the club he infused a remarkable spirit of enthusiasm into the players. To him, to a very considerable extent, belongs the honour of the proud position the club now occupies. In addition to the duties imposed on him by reason of his captaincy of the Football Club, Mr Brown has played a prominent part in the organisation and development of other local athletic clubs, and when it was announced that he was about to leave the city, it was generally felt that some mark of appreciation of his services in the cause of local athletics should be shown. Consequently a subscription list was opened, and in a short time about £60 was subscribed. With this amount, a handsome gold keyless chronograph watch and cahin were procured, and publicly presented to Mr Brown on Boxing-day. The presentation took place in front of the Spa Pump Room. A large concourse of people had gathered before the proceedings commenced, and the appearance of Mr J F Brown upon the scene was the signal for an outburst of hearty applause. On a raised platform at the principal entrance to the Pump Room were assembled a number of the honorary and playing members and friends of the Football Club, including Mr W C Lucy, the Rev E C Scobell, Mr Edwards, Mr W Robbins, Mr C Robbins, Mr W C Mann, Mr Woodward, &c. Mr Lucy made the presentation, and in doing so said that although he felt a mistake had been made in asking him to make the presentation, yet he accepted the duties of the office most cheerfully, and would endeavour to fulfil the intentions and wishes of the subscribers to the best of his ability. It was necessary, perhaps, for him to make some remarks about Mr Brown himself. Although they could not claim Mr Brown as a native of the city of Gloucester, yet he was proud to say that he received the latter part of his education at the Crypt Grammar School. In 1873 Mr Brown was mainly instrumental in establishing the Gloucester Football Club, which had been such a marked success; and in 1876 he succeeded Mr Hartley as captain of the club. At that time the number of members in the club did not exceed 40, but at the present time the number was between 300 and 400. On the resignation of Mr Walter Lucy in 1875, Mr Brown became captain of the Gloucester cricket club, a post which he had held honourably and successfully ever since. (Hear, hear.) In 1879, in conjunction with the Clifton club, he succeeded in forming a County Football Club, and during the past three years Mr Brown had been its honorary treasurer and secretary. In the year 1880, he was successful, in conjunction with others, in establishing the Gloucester Athletic Club, and they all knew what success had attended that club. Owing to his exertions, and also to the exertions of others with him, sufficient money had been advanced for the erection of their new pavilion, of which they were so proud, and which was a credit to the city of Gloucester. (Applause.) Mr Brown was also chairman of the Lawn Tennis Club, and for several years he was connected with Rowing Club; but not feeling that the duties of these offices were enough, he entered as a private in the City Rifle Corps. (Applause.) It was unnecessary for him to enumerate the many duties Mr Brown had undertaken, even while he was actively engaged in the duties of his own office in the post-office – duties which he (the speaker) ventured to assert had been the more efficiently performed on account of the recreation he had gained in advancing the sports with which his name had been connected. (Applause.) There was no greater test of of a man’s efficiency than success, and he knew perfectly well, having had some experience in the world, that unless Mr Brown had had great powers of organisation, combined with tact and good judgement, he never could have succeeded in the way he had. (Applause.) It was no easy matter to organise, develop, and carry out the work of these various clubs. There were different characters and temperaments to be dealt with, and unless tact and judgement were displayed failure would result. Mr Brown, who had both good tact and judgement, had admirably succeeded. (Applause.) Whatever he had undertaken he had endeavoured to ennoble. (Applause.) It had been felt by the subscribers that they could not permit Mr Brown to leave the city without giving him some acknowledgement of a substantial character, to serve as a memento of the esteem in which he was held by all who had come in contact with him. (Applause.) Not only was this felt by those with whom Mr Brown had worked in the various clubs, but it was also felt by the hundreds of spectators who had derived pleasure from witnessing the matches played. He thought they could look upon Mr Brown as a gentleman who had contributed more than any other person to the development of honest, good, and manly sport in the city. (Applause.) In an age like the present, when such a strain was put upon the mental faculties, they must not neglect the body, if they wished to have a nation of good, stout, and strong men. (Applause.) Turning to Mr Brown, Mr Lucy said he believed his influence would have a lasting effect upon the inhabitants of the city of Gloucester. He believed that whenever those persons whom Mr Brown had trained as his lieutenants, and whom he now left to carry on the work in which he had been engaged, had any doubt or difficulty, the first thought that would occur to their minds would be, What would Mr Brown have done under such circumstances? And when they had satisfied themselves as to what he would have done, they would, he felt sure, adopt the same course. On behalf of those who had subscribed – the number of whom, he understood, was more than 300 persons – he had great pleasure in presenting him with a gold watch and chain, and also an album. He ventured to express the hope, in which they all joined, that he might under God’s blessing be spared for many years – (applause) – and that whenever he had occasion to think of the od city of Gloucester, he would also think of the memento which he (Mr Lucy) now presented to him as a mark of the esteem and goodwill they all entertained for him. Mr Lucy then handed the present to Mr Brown, amid loud applause and waving of hats. Cheers having been given for Mr Lucy, that gentleman responded, and the proceedings terminated with three cheers for Mr Brown. Frank must have made visits back to Gloucester for Christmas, because he turned out for his old Club once in the 1884-85 season when he played on Boxing Day against a London Team. His final game was again on Boxing Day, in 1885, against R.J.James’ London Team. Frank was a sportsman in many fields in addition to rugby. He captained Gloucester Cricket Club, for whom he was a demon bowler, and he organised the County Cricket Club, as well as the Gloucester Amateur Athletic Association and Rowing Club, and was Chairman of the Lawn Tennis Club. By 1891, Frank was a civil servant in the surveyor’s department, but he subsequently emigrated and the leadership qualities which had been so evident on the rugby pitch served him well when he became Post Master General of South Africa. Later in life he returned to his roots, and died in Gloucester in June 1927.